Untitled by Ketut Teja Astawa (Lot 555), with a pre-sale estimate of Rp 30-40 million, is just one of the 77 items that will be up for sale at the upcoming Larasati Traditional, Modern & Contemporary Art auction on Saturday, Feb. 16, at the Larasati Art Space in Ubud, Bali. Balinese contemporary artist Astawa (b.1971) has experimented with the iconography of Classical Balinese Kamasan paintings for more than 20 years. He reinterprets the imagery in his own, often humorous, innovative compositions, that evoke a strong sense of spontaneity. 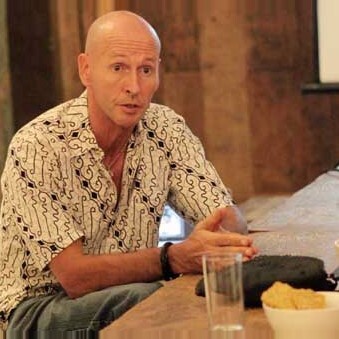 His signature style has become one of the most recognizable and important developments in Balinese contemporary art. 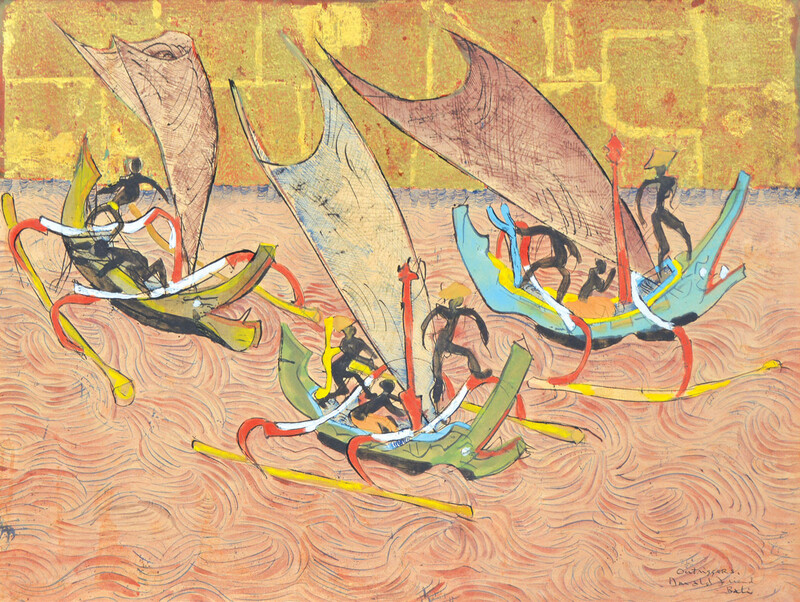 The Larasati auction features an array of media spanning ink sketches on paper, watercolour, gouache and aquarelle works on paper, acrylic and oil paintings on canvas, colour prints, and a lithograph by distinguished Balinese and international artists such as Gusti Nyoman Lempad, Ida Bagus Made Poleng, Gusti Ketut Kobot, Nyoman Gunarsa, Arie Smit, Miguel Covarrubias and Donald Friend. The auction offers opportunities for seasoned connoisseurs and mid-level collectors, as well as those just starting to collect art. 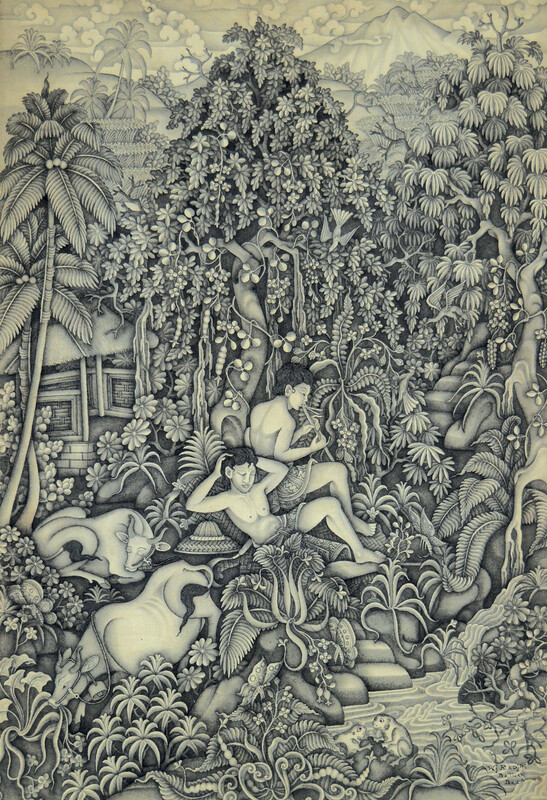 Two of the highlights are Outriggers Bali (Lot 513) by the renowned Australian artist and diarist Donald Friend (1914-1989), who lived in Bali from 1968 until 1980. This striking 47 cm x 63 cm pen, ink, gouache and gold leaf composition on paper features three traditional sailing boats on the ocean and carries a pre-sale estimate of Rp 85-95 million. Lot 541 (est. Rp 65-80 million) is Village Scene in Batuan ( 1968 ), a 42 cm x 82.5 cm vibrant, playful composition of acrylic on canvas with dynamic coloration by one of the most popular Batuan traditional painters, Ida Bagus Made Widja (1912-1992). For new collectors with smaller budgets, the following works are good entry points, especially if purchased within their pre-sale estimates. Dasa Muka (Lot 525; est. 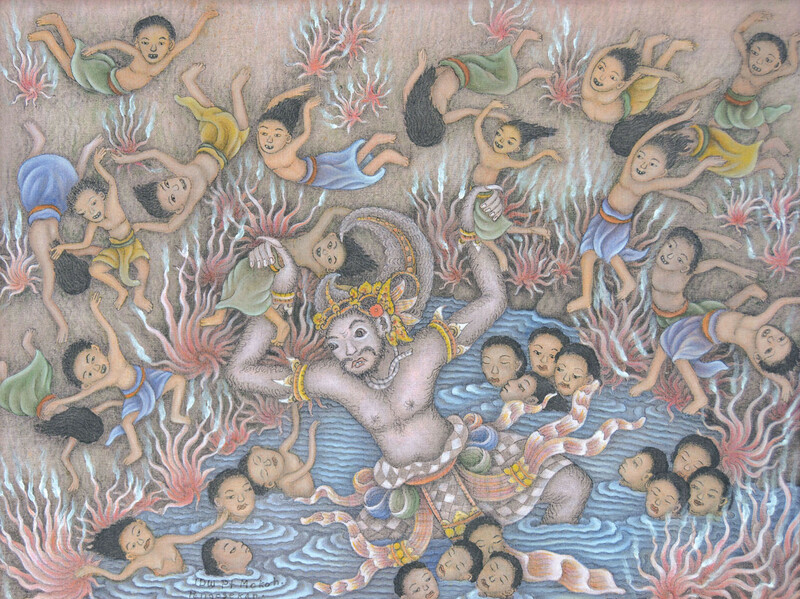 Rp 12-15 million) is an excellent composition by Gusti Nyoman Moleh that features Balinese mythological characters. Bima ke Suarga Loka (Lot 526; est. Rp 15-20 million) is by the renowned and unconventional painter Dewa Putu Mokoh (1913-2010), and Lot 559 (est. Rp 14-18 million) is Balinese Temple by Kartika Affandi (b. 1934), the daughter of Indonesia’s first modern master Affandi (1907-1990). The following works will capture the attention of connoisseurs of Balinese traditional art. Nyoman Kayun (b. 1954) is considered one of the last living masters of the Ubud school of traditional painting, his compositions often depicting traditional folktales that are transmitted orally through song. 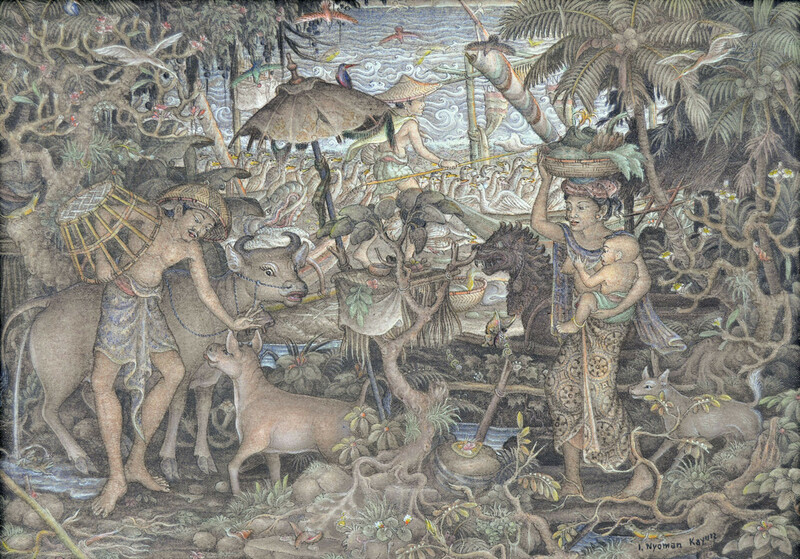 Keluarga di Desa by Kayun (Lot 520; est. Rp 35-45 million) has good provenance, while Lot 523 (est. Rp 55-75 million) is Gembala Sapi by Wayan Radjin (b.1945), the son of the celebrated Batuan artist Made Djata (1920-2001). Ida Bagus Made Poleng (1915-1999) was born in the village of Tebesaya, Ubud, and was considered the finest of all of traditional Balinese painters. His paintings, which he referred to as "his children", are in high demand. Mandi di Pancuran (Lot 524; est. Rp 130-180 million) is a 49 cm x 32 cm acrylic on canvas composition that depicts two men bathing. Lot 543 (est. 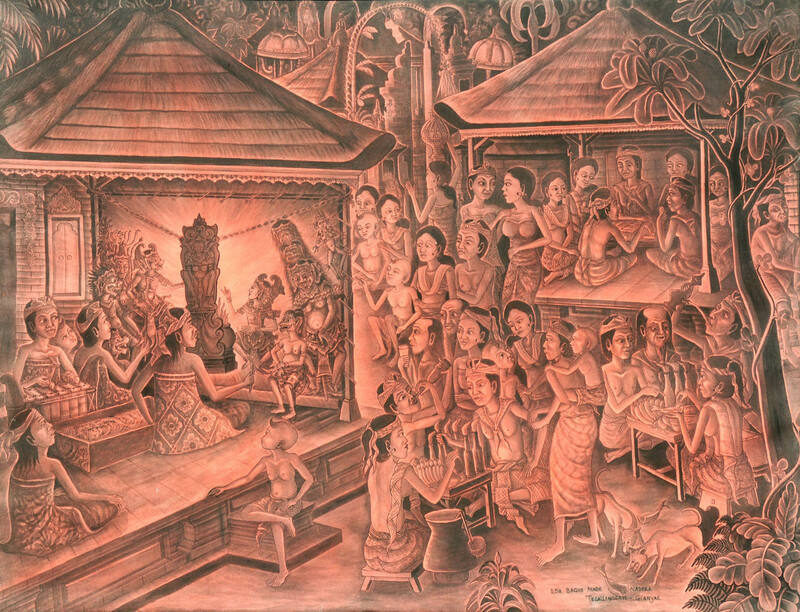 Rp 30-40 million), Nonton Wayang by Ida Bagus Made Nadera (1915-1998), depicts a crowd of villagers watching a wayang kulit performance In charming, glowing reddish tones. An unusual item on offer is Lot 510 (est. Rp 10-13 million), Rice Granary, Bali, a 36 cm x 28 cm lithograph by Mexican artist Miguel Covarrubias (1904 -1957) that comes with good provenance. Covarrubias was a gifted caricaturist and illustrator who wrote the landmark 1937 cultural and social study, Island of Bali. Two other possibilities in Balinese contemporary art, aside from the aforementioned Untitled by Ketut Teja Astawa, are Mencari Orang-orang Marjinal ( 2003 ) by Made Palguna (Lot 553; est. 18-24 million) and the final lot of the auction (Lot 577; est. Rp 35-45 million), two provocative paintings by the iconic Balinese female artist IGAK Murniasih (1966-2006), Energiku Bertambah ( 2003 ), 70 cm x 70 cm, and b. Malam Bergelora ( 2001 ), 26 cm x 30 cm. Made Palguna has developed his own distinct "voice" in Balinese contemporary art, while Murniasih raises issues of sexuality, identity and gender politics in her works. 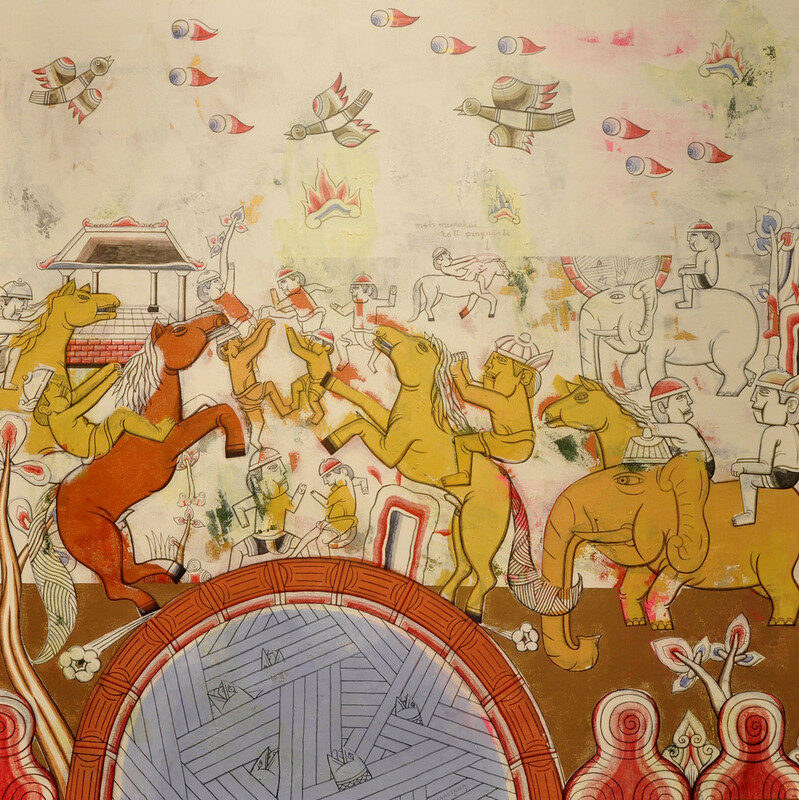 The auction presents many other strong works, including two by the renowned traditional painter Gusti Ketut Kobot (1917-1999, Pengosekan, Ubud), Jatayu (Lot 531) and Scene from Rajapala Story (Lot 527), while The Witch and the Servant, an ink on paper sketch by Gusti Nyoman Lempad (Lot 528) has excellent provenance. Collectors interested in Indonesian modern art can find good works by artists Widayat, Soedarso and Soedibio. Buying art as an investment is possible with the right strategy, and this includes purchasing and holding a work for at least 10-20 years before reselling. Potential buyers bidding over the phone, absentee bidders and real-time Internet bidders unable to attend the previews or the auction are advised to contact Larasati and enquire about the accuracy of colour reproduction in the online catalog to ensure that they can realistically appraise the lots they want to bid on. The unnoted condition of a lot listed in the catalog does not imply that the artwork is free of faults or imperfections, and the summary conditions of the works are available upon request, from their current state to whether it has been repaired or overpainted. The catalog provides provenance – the historical data of the work's previous owner or owners. The catalogue is available as a downloadable PDF, while the Larasati Auctioneers website provides information for prospective buyers and downloadable absentee bidder and registration forms. The buyers guide contains information on pre-auction to post-auction details, including conditions of business, the bidding process, buyer's premium and payment, storage and insurance, and shipping. Viewings run from 11 a.m. on Thursday, Feb. 14, through 1 p.m. on Saturday, Feb. 16, while the public auction opens at 2:30 p.m. on Saturday, all in the Tebesaya Gallery of Larasati Art Space. Feb. 14 (Thurs. ), 11 a.m-7:30 p.m.
Feb. 15 (Fri.), 11 a.m.-7:30 p.m.
Feb. 16 (Sat. ), 11 a.m.-1 p.m.
Feb. 16 (Sat. ), from 2:30 p.m.